A Daily Dose of Fit: I've taken up the gauntlet. I've taken up the gauntlet. Back in the day—medieval times, really—knights in shining armor would wear special gloves to protect their hands during combat. However, not gloves like you and I know. (Like I know quite well right now, actually. Ugh.) Think shiny metal gloves that stand up against swords and other such weapons. Present day, you don't much see gauntlets, but we have been known to reference them. Ever hear the phrase "take up the gauntlet" or "throw down the gauntlet"? They're creative ways to say "accept the challenge" or, quite simply, "to challenge". Mind you, I was in my Vibrams the whole time which is why I didn't go the distance I usually do. Although it was 30 minutes of activity, followed by some planks and other fun core exercises. I was sweating, believe you me! And if you're wondering how the Vibrams held up, so far...so good. I'm really liking them, despite the sore calf muscles. Still, to be expected. Moral of the story: I've taken up the gauntlet and you should, too. 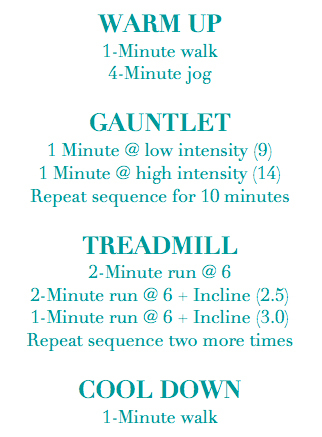 Don't be intimidated by it as it's a truly great resource for burning calories. 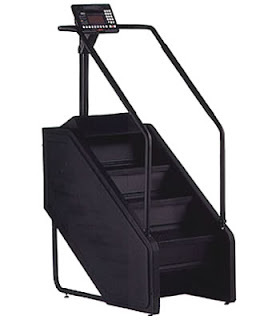 And trust me, it's a lot different than those other step machines. We'll see how my hard work affects my dunes run this weekend. Yeah, I'm going again. Either I'm a sucker for torture, or I just really liked it. Once again, we'll go with the latter. Question: What has your week looked like so far in terms of cardio exercise? I LOVED the Stairmaster at DePaul. I sure do miss it. We had the ones in the picture and seriously..best cardio ever. New toys at the gym! WIN THIS: A deeeelicious bag of PRO OATS! Let's talk about stretch, baby. My core hurts. No, really...it does.